Some problems can’t be sung away. | Come Here To Me! Some problems can’t be sung away. Is there anything as sweet in football, or as painful, as a last minute goal? At half-time tonight in the Dublin derby between Saint Patrick’s Athletic and Bohemians i genuinely considered sticking in McDowell’s pub. 45 minutes later, and we’d gone from a goal down and playing horrific football to robbing it with what was basically the last kick of the game. We’ve been on the wrong side of the oul’ ‘last kick of the game’ a bit too often for my liking in recent years, so it felt very sweet indeed. A classic bit of Northern Soul from The Shirelles came to mind. Pre match effort from Saint Patrick’s Athletic fans. It’s draws, mainly. Perhaps the most interesting part of tonight however was the appearance of protest banners across the league in opposition to the total shambles that is the current set-up within the Football Association of Ireland. The FAI has the dubious honour of paying its president more than the combined prize-money available to all sides across the league. While the associations president, John Delaney, was recorded on the total piss in Poland engaging in sing-song sessions, Monaghan United were forced to drop out of the domestic league in less than dignified circumstances, only mid-season. They are not the first, and I dare say won’t be the last, top-tier side to fall in such circumstances. 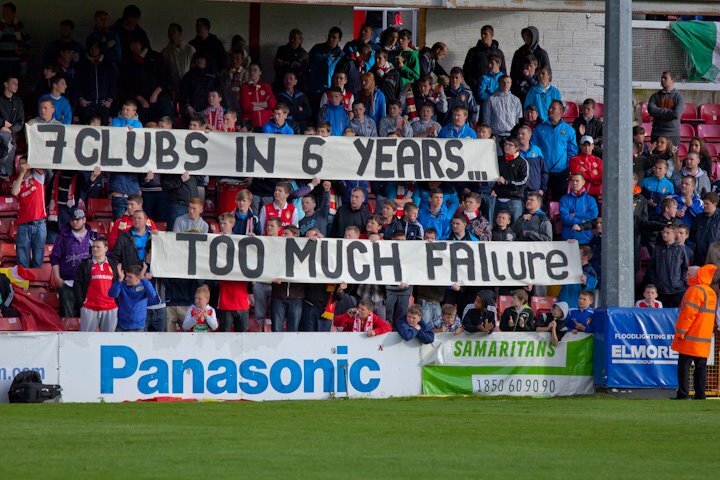 Saint Patrick’s Athletic (“Seven Clubs, Six Years: Too Much FAIlure”), Derry City (“JD Drinks, while the LOI sinks”), Bohs (“Ireland’s Football Problems Can’t Be Sung Away”) and Drogheda (“Gr€€dy, Corrupt, FAIlures”) fans all unveiled banners tonight making their feelings known on the running of ‘The Beautiful Game’ here. For me, the Bohs banner captured it all perfectly. It may be loney ’round the fields of Athenry, but it’s pretty grim in Gortakeegan too, without a local football side. 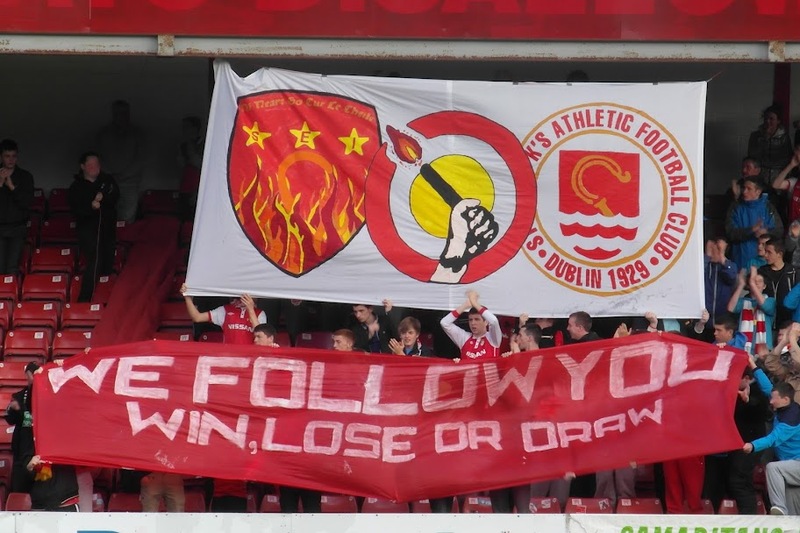 Saint Patrick’s Athletic protest banner. Photo (c) Paul Reynolds. 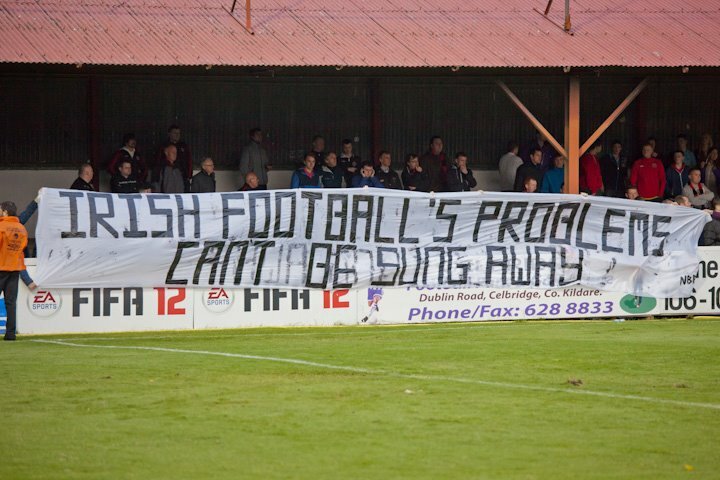 Bohs protest banner. Photo (C) Paul Reynolds. 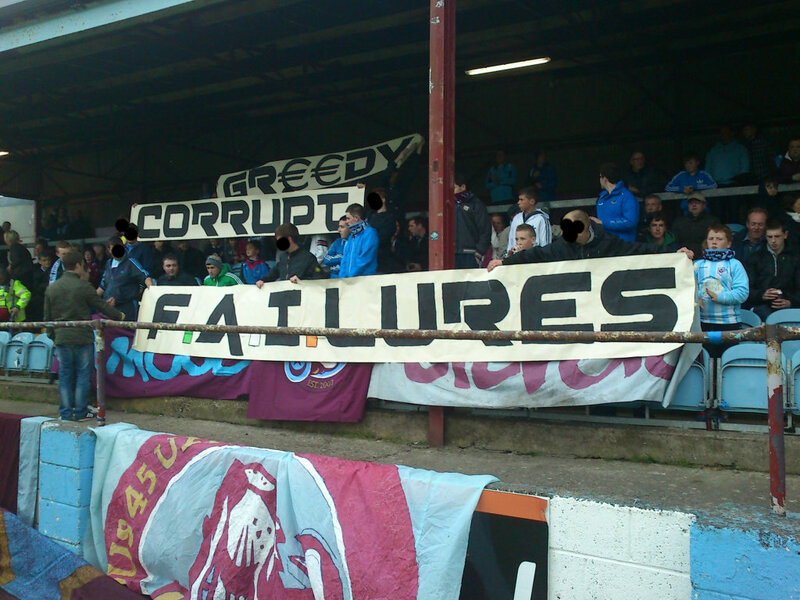 *Update: As mentioned in the piece above, Drogheda United fans also staged a protest last night against the FAI. This image comes from the F45U (Drogheda United’s ultras). Their club has since issued a statement condemning their fans, mainly for anti-FAI chants containing bad language. It remains to be seen if any action is taken against any group of fans. It just shows how out of touch Irish soccer fans (of English teams) are with soccer in their own country when they meet Delaney and act like a FF Cuman running into Bertie outside the Beaumount house. The last few years especially have proven that there are quality young players coming form the LOI. McClean, Doyle, Long, Fahey (to name but a few) all came though at LOI Clubs are are doing well across the water. But the general Irish football fan doesn’t seem to care they say the LOI is useless but don’t seem to be able to contemplate that the more that attend games the more money the club get and the better player they can buy & the better their youth development system become. Been think this for a long time now, I’m a Finn Harps fan and ever since the 1999 FAI Cup final which had two replays(its called a final for a reason its meant to be the final game) the only reason they had this was to make money 3 trips to dublin and we didn’t even win it. But TBH as long as Dealney etc keeps been seen on TV with the Irish National team and buy the odd round of drinks for fans nothing is gonna change.